France is no stranger to disruptive mass protests. But the “Yellow Vests” movement that blocked its highways last weekend represents a new front of struggle against neoliberal president Emmanuel Macron. Last weekend more than 300,000 people took to the streets — and highways — across France, marching, disrupting traffic, and blockading thoroughfares to protest rising fuel prices. 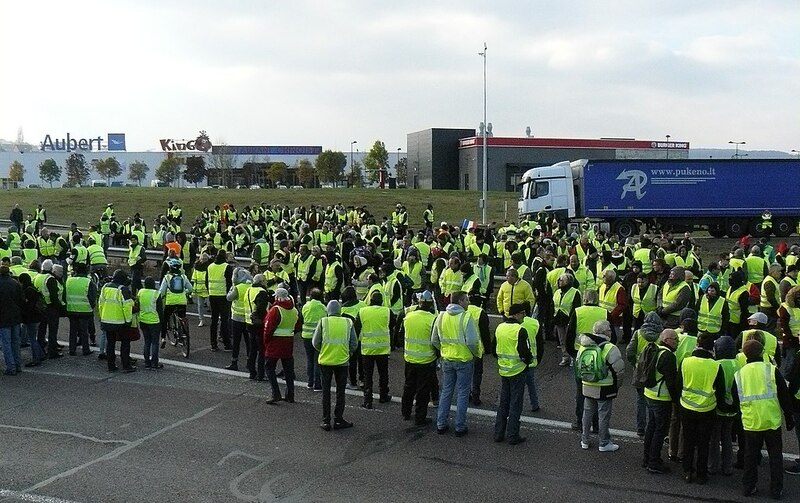 United by their anger at the rising cost of living, they responded to social media calls to “block the country” and show solidarity by donning “yellow vests” (gilets jaunes) — an article of clothing French motorists are required to carry in their cars in case they break down. The mobilization has waned since Saturday, November 17 — its first day — when, according to the Interior Ministry, 290,000 people took part in more than 2,000 different blockades and rallies across France. Despite calls to keep up the pressure, just 46,000 turned out on Sunday and 20,000 on Monday. The movement appears far from dead, though. Protesters are gearing up for a march on the capital next Saturday: “Act 2: All of France to Paris,” the Facebook event promises. The Left, too, has been caught off-guard. While labor unions and left-wing parties have led most of the protests under Emmanuel Macron’s presidency until this point, they’ve been either missing in action or reduced to minor supporting roles for the “yellow vests.” None of the major union confederations have endorsed the protests. Nor have major political parties, from the Socialists and Greens to France Insoumise (“France Unbowed”). The latter’s head, Jean-Luc Mélenchon, has offered his personal support to the movement, arguing “the people are right to revolt.” But so, too, has the far-right: figures like Marine Le Pen of the National Rally (formerly known as the National Front) and Nicolas Dupont-Aignon of Debout La France (“France Arise”), a self-described sovereigntist who would have served as Le Pen’s prime minister had she won the presidency last year. The protests are messy and dangerous. Their basic form — people gathering on roads and trying to block traffic from passing — is an invitation to confrontation and sometimes much worse than that. The Interior Ministry counts more than five hundred injuries so far. One elderly protester was even killed after she was struck by a panicked woman driving her daughter to the doctor’s office. Perhaps the most remarkable fact about the movement is its genuinely grassroots origins. The mainstream right-wing Les Républicains as well as the far-right National Rally and France Arise parties have all printed posters and flyers in support of the movement — calling for the defense of “car drivers” — but they appear to have had little to do with the actual planning of the protests. Lacking formal leaders or spokespeople, the movement originated online. Those two calls went viral — and for a very simple reason: Fuel prices in France have skyrocketed over the past year. Most French motorists use diesel, whose price has spiked by 23 percent in the last twelve months to €1.51 per liter — its highest level since the early 2000s, according to the AFP news agency. (In American terms, that’s a whopping $6.53 per gallon.) On top of that, the government has pushed forward with fuel taxes — part of its environmental agenda — that have hiked the price of diesel by 7.6 cents per liter and gasoline by 3.9 cents. It plans a further levy of 6.5 cents on diesel and 2.9 cents on gasoline in January 2019. Those increases have weighed heavily on rural areas and on what’s known as la France périurbaine, the outer bands of the nation’s urban agglomerations. The diminishing quality of public transit — and of public services — in these parts of the country stands in stark contrast to the well-funded bus and rail network of Paris, feeding into a sense of cultural resentment shared by many protesters. Many of those donning “yellow vests” are working class: a mix of low-income workers, retirees, and the unemployed. They include people like Bertrand Rocheron, a father of three in his forties who currently works as a part-time middle-school assistant, and commutes seventy kilometers a day from his home in rural Brittany. “My deepest fear is that my car is going to break down, it’s at the end of its days,” he told his regional newspaper. Others are more solidly middle class: mid-level managers or white-collar professionals like Nathalie, a fifty-one-year-old psychiatrist in suburban Paris who earns just above the minimums required for state aid. She told Le Parisien newspaper that she feels like she has “fallen in social status” — this, despite putting in five years of university studies. Tellingly, the national website for the blockades doesn’t have a page for demands. Protesters are more united by what they oppose than what they favor — and even that isn’t terribly well-developed. There is a sense that fuel prices are out of hand, the broader tax system is unjust, and that this is preventing decent people from living the lives they’d like to be leading. The uprising has invited comparisons to the peasant jacqueries of medieval France, short-lived and disorganized rural rebellions that left little lasting political impact. Others have drawn parallels to the poujadistes, an anti-tax movement in the 1950s led by the most reactionary elements of the French middle class. Others, still, have likened the “yellow vests” to the US Tea Party movement under President Obama. This seems especially unfair. As Alexis Spire, a sociologist and author of a recent book on anti-tax revolts in France, has pointed out, the “yellow vests” are not calling for the state to back out of civic life. They’re calling for it to act more equitably, and are taking to the streets in response to the diminishing returns of public services. At points, more explicit class politics have been expressed: some protesters have slammed the government for maintaining the fuel tax — which hits middle- and low-income people — at the same as it defends repealing the wealth tax — which applied only to those with more than €1.3 million in assets. It’s unclear whether the “yellow vests” will prove a lasting movement against an increasingly unpopular government, or yet another flash in the pan. For now, many on the Left are intent on shunning the protests entirely, turned off by their hostility toward taxes and environmental regulation as well as the sympathy they’ve earned from right-wingers. Those reservations are understandable. And yet it is probably not worth handing the national conversation over to Le Pen and fear-mongering ghouls like her, without a fight. National Rally leaders, for their part, see this as their time to shine — so much so, apparently, that they’re willing to set aside their historic mistrust in street protests and civil disobedience. If the party is making an exception for the yellow vests, it’s because the revolt appears to incarnate their own idealized electorate: a “forgotten France” of workers and lower-middle class whites living outside major urban areas that wants to stick it to Parisian elites. The National Rally’s support of the movement, in spite of violent clashes with police, also stands in stark contrast to its usual veneration of law and order. The party regularly criticizes the slightest use of force from left-wing protesters against law enforcement. And when striking workers blockaded roads just last year, party leaders didn’t hesitate to mock them and accuse them of hurting ordinary commuters. It would be a tremendous shame to allow the twisted worldview of the National Rally and its allies set the terms of the debate. In the end, the source of the conflict is clear: it’s not about rural and suburban areas versus Paris, or about environmentalists versus commuters. The real target of this fight is a government that looks out for the wealthiest of French people, while ignoring everyone else that’s been cast aside.